San Francisco Small Business Week is a partnership formed to honor and support more than 120,000 thousand small businesses and entrepreneurs that call San Francisco home. 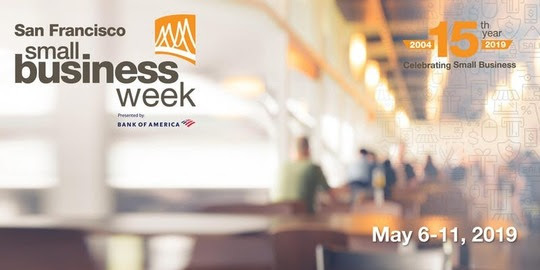 As part of National Small Business Week, we celebrate the contributions and achievements of small business owners by offering a series of educational and networking events designed to inspire, educate and connect the members of our business community. Please join us at one of over 40 events or celebrations happening throughout the week of May 6th to the 11th in San Francisco. The U.S. Small Business Administration and SCORE will host a 2-Day Virtual Conference during National Small Business Week. The conference will take place Tuesday, May 7 – Wednesday, May 8 between 11:00 AM – 5:30 PM Eastern / 8:00 AM – 2:30 PM Pacific each day. The City of Oakland will mark National Small Business Week (May 5 - 11, 2019) with a variety of free workshops and events. The theme this year is Helping Oakland's Diverse Business Community Thrive. For 2019, they are taking the workshops into the commercial districts that small businesses call home.